In the photo are TMN’s Scott Cobb and Alison Dieter at the press conference at the Texas Court of Criminal Appeals for the announcement that 20 lawyers, including State Rep Harold Dutton, were filing a complaint against Keller. Hmm, wonder what job Keller will get if she can’t be a lawyer anymore. She could be a prison guard, but the warden might not trust her alone after 5 with the inmates. She might start executing them on our own. Sign the complaint against Keller. 708 people have signed so far. Judge Sharon Keller, the presiding judge of the state’s highest criminal court, doesn’t see anything wrong with closing the court’s doors at 5 p.m. sharp on a day when 1) the U.S. Supreme Court announces it will hear a precedent-setting lethal injection case and 2) a Texas man is set to be executed by lethal injection. Wow. That’s some Texas justice there, boy. To close at 5 p.m. and refuse to accept an appeal by a person about to be executed is a violation of judicial responsibility. When a person is about to be executed, our state’s highest criminal court needs to remain open for business. As long as Keller is in office, the people of Texas cannot be sure that justice is being done with integrity. Judge Sharon Keller should resign or be removed from office by the State Commission on Judicial Conduct, which is responsible for investigating allegations of judicial misconduct. 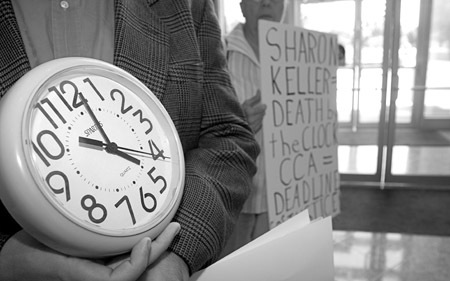 If you are as shocked as I was by Judge Sharon Keller’s refusal to accept an appeal 20 minutes after 5 p.m. from lawyers representing a man about to be executed, then sign on to the general public complaint against Judge Sharon Keller by going to SharonKiller.com. The complaint will be submitted to the State Commission on Judicial Conduct on Oct. 30.